A Penny for my Thoughts: I Quit! I've never done it before...oh, I have left jobs but it was always with the reason of moving or accepting another position. This time it was different. I tried so hard but each day I would be so stressed by the end of the day. I could feel my blood pressure rising and my chest hurting. I knew that it just wasn't good so I made the decision to quit. My last day will be October 9th. Thankfully I have a super supportive husband. And thankfully I had our most wonderful and dear friends stop in to spend the evening with me. 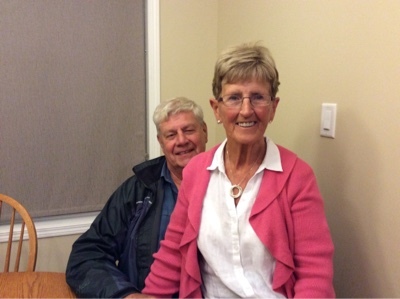 Howard and Hilda are friends from way back and they have been a constant support to us over the years. They were on their way through the province and stopped to take me out for supper and spend the night. It was so great to see them even if it was too short of a visit. So another journey begins for me....where will it lead me? To another position or pajamas and a good book? Oh my goodness! I didnt expect to see this when I came on! Based on the stories I heard when you would come home, it didnt sound like a very enjoyable job for you.